"This is a great laser product and it has worked so well with my hair!" What should you expect with hair laser use?It can take up to four months to see results, but it is usually much sooner*. In the first month, you may begin to notice some shedding of fine hairs. Don't be alarmed or freak out, this just means the laser is working. Every hair follicle has a 4 stage cycle of growth and shedding that it naturally goes through while it is still active. The last of these stages is where the hair falls out. It is then soon followed by a new hair emerging from the follicle. If you see more shedding than usual, be encouraged. It's a good sign. This means that the laser is stimulating the natural cycle of the follicles that were in the last stage. This will soon be followed by more and thicker hair. You may still see some shedding, but by the middle of this month, this will probably be coming to an end. 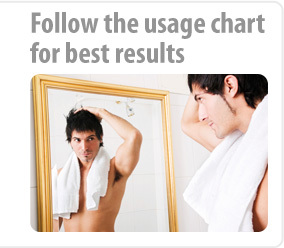 By now you may start to notice some thicker hairs, and a fuller head of hair. This is around the time people start to get really excited. It's usually quite a relief to know that you can handle the problem and that you have a permanent, safe answer. By now there shouldn't be any more shedding. At this point you should definitely see some thickening*. Continue using the Super Grow 50. The laser is working on hairs that were getting thin. This is around the time people start to get really excited. It's usually quite a relief to see thicker, fuller hair and know that you have a permanent, safe answer. The laser hair therapy is working. In the fourth month you should be seeing noticeably thicker, fuller hair*. Continued use in the coming months will bring even fuller results. In the clinical salons you buy a treatment program typically from six months to a year. In this timeframe you will see pretty full results from the treatments. In the laser hair salons, you sign up for an initial contract, which costs $3,000 - $6,000. After this is over you come back for touch-up visits as needed, to hold the gains. As mentioned earlier, these visits cost around $200 each. Just four touch up visits a year would add $800 your annual budget. The good thing about having the Super Grow 90 on your own is that you can always come back when you need it, free of charge. Forever. "I cant believe how much this has worked for me! This is the best laser deal on the market bar none!" "I have found this product to be very easy to use and so far the results have been great!" "Hi Jeff, I want to buy one of these lasers for all the women in my family! Female hair loss is so much harder to handle than male yet your laser has done wonders for my hair." "Results have been great. My hair looks brighter and more healthy and stronger. "My family has commented that they have seen a difference.